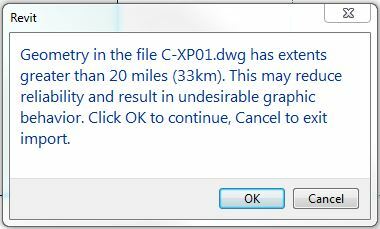 The first step in setting up a landscape/site in Revit, is linking in the CAD survey. While it is easy to do, there are a few settings that you want to make sure you have right (especially if you have CAD files pre-linked in your project template). I’ve highlighted the important settings below. The rest don’t matter as much, or are personal preference (I prefer to preserve my colors). Import units usually auto-detects correctly, but occasionally it doesn’t (so watch out for that). Current view only and correct lines that are slightly off axis should always be unchecked. Layers/Levels should be set to All. [Update] For Positioning, either Auto – Center to Center or Origin to Origin will work, though Origin to Origin is usually the safest option. I recommend against all of the Manual options, as discussed in a later post: Linking CAD Files with Large Extents. It is also best practice to put dwg links on a separate workset (one that is not visible in all views). That way they only show up in plan (and not sections and 3D views). Once it is linked in correctly, pin it down and be sure to Establish Coordinates via the Survey Point. Managing linked CAD layers can become tedious, especially if you have your import settings tied into view templates. 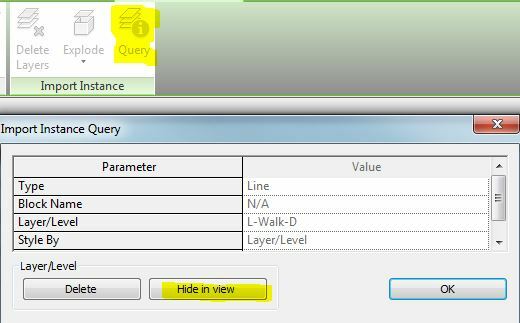 It is easiest to use query/hide in view to turn off large sets of layers and then tie those settings back into your view template periodically, as needed. This saves time in trying to navigate through long list of layers.